Eyeshine is a four piece, "edge rock" band originating in West Hills, California, formed in 2004. The band consists of Johnny Yong Bosch (lead vocals, rhythm guitar), Maurice Salmin (drums, percussion), Masataka "Polo" Yazaki (lead guitar) and Ginny Eck (bass, strings). The band's demo album, "How About That?" 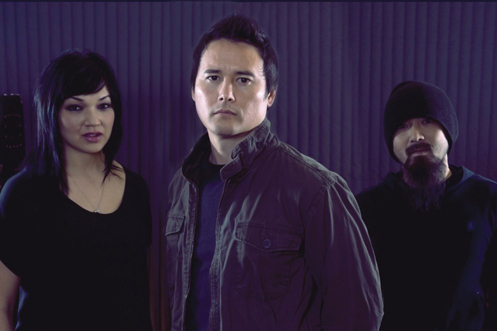 (2006), launched them into the underground rock scene with limited success but the band achieved nationwide fame with the release of their second LP album My Paper Kingdom (2009), which received multiple awards, including Elfenworks Social Justice award for their song, "Alone." In 2011 they recorded "Love Psalm" with Mary Elizabeth and Akira Yamaoka for Silent Hill: Book of Memories. Eyeshine won Ford Motor Company's worldwide band battle in 2012 and recorded a single with Grammy Award winning producer Don Was (Rolling Stones, Elton John, John Mayer…etc.). They have since toured worldwide and self produced over 11 albums. Other notable achievements include winning performance spots on Warped Tour and Ernie Ball's Rockstar Energy Drink Uproar Festival as well as having their music chosen for promotional use in the Call Of Duty Endowment project in 2013. After Power Rangers, Johnny became very involved in voice over work for various titles. His first major voice acting role was Vash the Stampede in Trigun. He later went on to play the voices of Kaneda in Akira, Renton in Eureka Seven, Claus in Last Exile, Clair in Heat Guy J, Sakaki in Witch Hunter Robin, Mike in Please Twins, Albert in The Count of Monte Cristo, Kiba in Wolf's Rain, Itsuki in The Melancholy of Haurhi Suzumiya, Ichigo Kurosaki in Bleach, Lelouch Lamperouge in Code Geass, Izaya in Durarara and Troy in NFL Rush Zone and Guren in Tenkai Knights. Johnny’s voice can also be heard in numerous video games. He voices the main character Nero in Devil May Cry 4 and performed voiceover work in .hack//G.U. , Persona 4, Disgaea 3, Tales of Symphonia, Tales of the Abyss, Eternal Sonata, Bumblebee in Transformers: War for Cybertron, Yang in Street Fighter IV, Zero in Marvel VS Capcom 3 and Torian Cadera in Star Wars The Old Republic. When Johnny is not voice acting, he is the lead singer and rhythm guitarist of the band Eyeshine.